Being a Formula One driver is a bit like being a rockstar, except for a stricter diet. A driver is only as good as the team around him. You’ve got the chief race engineer on lead guitar, software technicians on keyboards, the spokesperson on backing vocals and the mechanics making up the rhythm section. So which band would a grand prix team be? Were born out of an older outfit. Joy Division became New Order, and Jaguar Racing became RBR. Each proceeded to spend a fortune on product design. The band had their own nightclub, the Hacienda, whereas Red Bull take their ‘Energy Station’ to every race, complete with DJs. The triple world champions have established a new order in F1. Lawyers have closely scrutinized their work after disagreements with former members. Floyd found inspiration from outer space when they recorded the original score for images transmitted from the first moon landing. McLaren sought similar inspiration when they built their factory. And they supplied composites for the Beagle 2 space probe. Fabulously successful, rich, highly political and have the ear of governments. They’ve been around for ages, won every award going, and continue to put on a flamboyant live show. U2 are doing alright too. Have a tendency to rest on the laurels of past glories. The Gallagher brothers could never agree who the front man was. Ross Brawn, Niki Lauda, Toto Wolf and Paddy Lowe may have a similar debate. You just don’t know what to expect from them. They release one critically acclaimed album and follow it up with a howler. Then, a couple of years later, they’re the benchmark again. After years in the doldrums the Enstone-based F1 team are contenders this year. These public school boys from Oxford were huge up until the late 90’s and then went all avant-garde. Many thought the end was nigh when they separated from their record company / works engine supplier, but going independent seems to suit them. Williams’ stock market floatation has taken ownership to the fans. These mod rockers went by four different names in just two years: The Confederates, The Detours, The High Numbers and The Who. A bit like Jordan/Midland MF1/Spyker/Force India. Both have a habit of smashing their equipment. The scene of fisticuffs, Stevie Nicks and the other girl routinely beat each other up while team principal Franz Tost has been known to motivate drivers with his fists. The band spent £2 million on a party by flying all their friends to the South of France, as Red Bull/Toro Rosso do in Monaco. One of the Fleetwood members disappeared to join a religious cult. Scott Speed went off to race NASCAR. 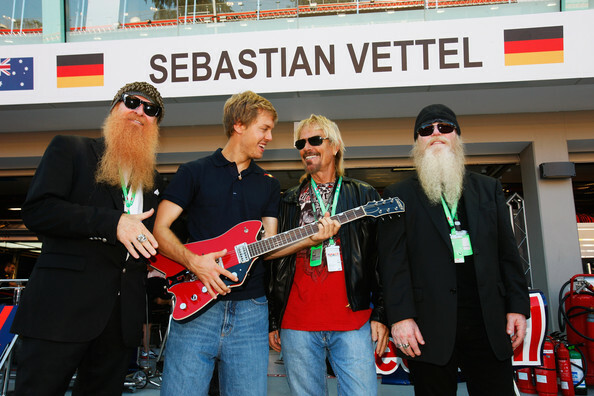 The Malaysian entry used to be a cover band of one of F1’s most successful ever teams. With a lick of green and yellow paint, fans celebrated the return of Lotus. Then they had a major falling out with Lotus and decided to re-brand themselves Caterham, largely because they didn’t have to buy new paint. Arriving on the crest of New Wave hype, with lots of computerized effects, SSS’s record company never saw any return. The band even used the slogan “Fleece the World”, and the best they could manage was a number two in the charts. If the entirely CFD-designed Marussia, nee Virgin, could finish second they would be over the moon, but that ain’t going to happen.